When you look at your dashboard or reports, you don't see time logged. So you wonder what's wrong. There could be several possible reasons why this is happening. RescueTime is not running on your computer. You've two different accounts, and you're logged in with the wrong one. It's easy to know! 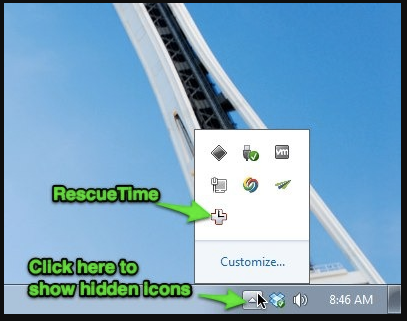 On Windows check if the RescueTime icon is in your system tray. If you don't see it click the show hidden icon on your system tray to make sure that Windows hasn't automatically hidden it. On Mac look for the RescueTime icon in your OS X menu bar located on the upper-right side of your screen. In either case, if the icon is not present, you'll need to install RescueTime. You confirmed that RescueTime is running, but you're still not seeing data on your dashboard. It could mean that you've multiple RescueTime accounts. The easiest way to confirm if this is the problem is by selecting Help from the RescueTime icon and sending the Customer Support Information to our Support team. Note: In some cases, it might be necessary to quit and restart RescueTime to fix an issue where the application has crashed or is no longer working. This process should also allow it to find any patches or updates. How can I reset my RescueTime application configuration?